Long before morning I knew that what I was seeking to discover was a thing I’d always known. That all courage was a form of constancy. That it was always himself that the coward abandoned first. After this all other betrayals came easily. 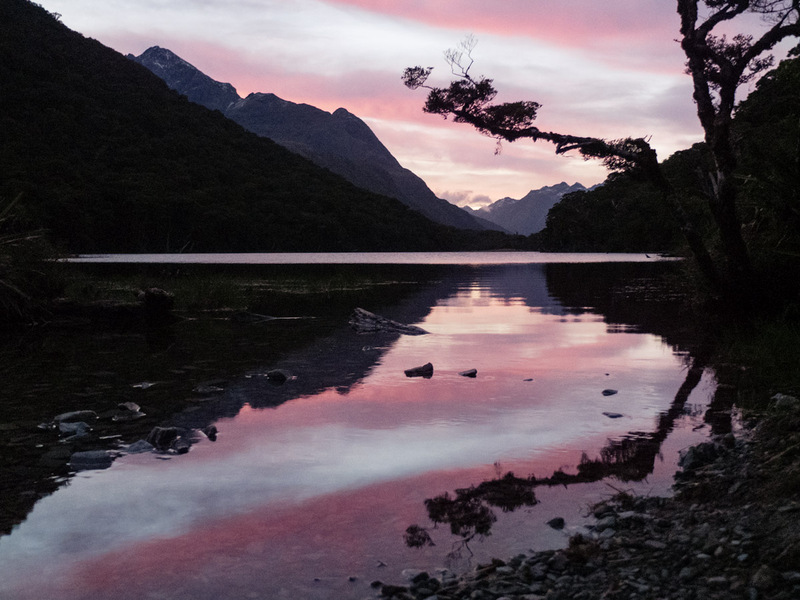 With nowhere but the woods to stay in Queenstown I took a bus, alone, to Te Anau, with the aim of doing the Kepler and Routeburn tracks, two multi-night walks through the mountains of Fiordland National Park. 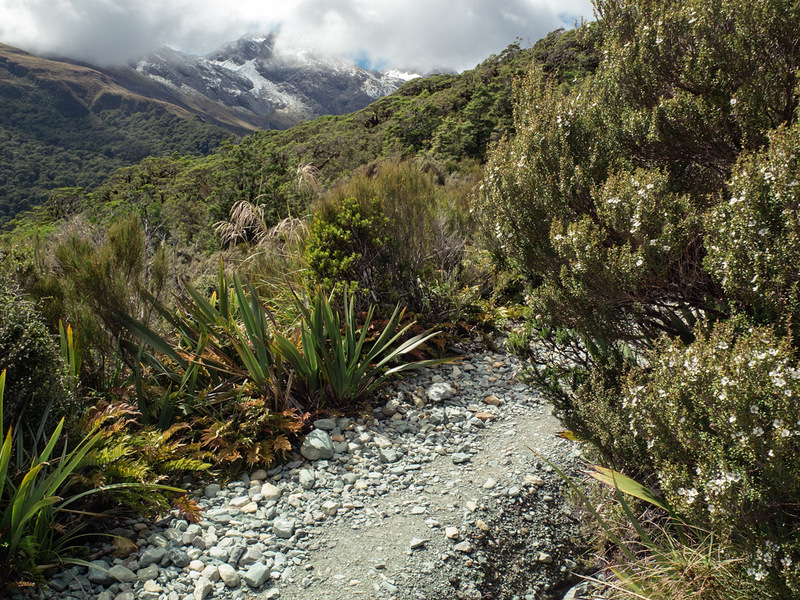 The first day on the Kepler track was glorious. 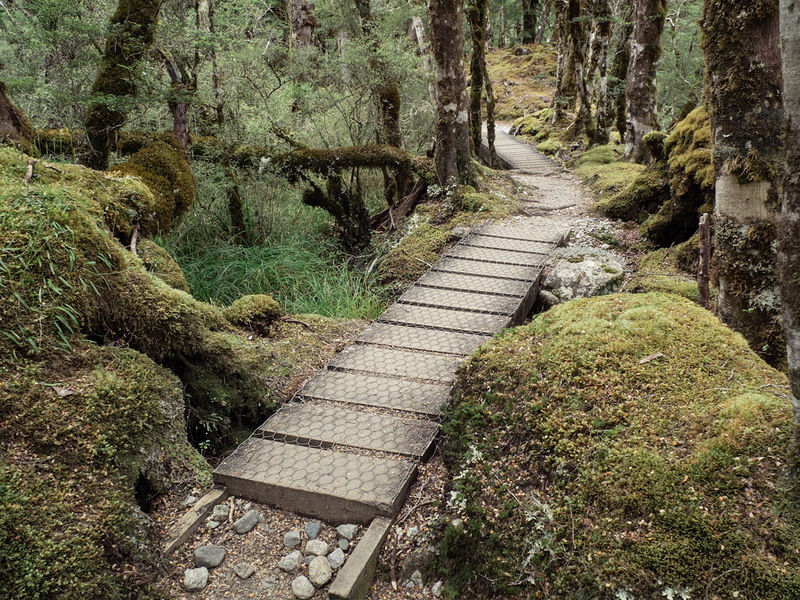 Never had I seen such verdant forest, the trees thick with lichen and the floor carpeted with moss. 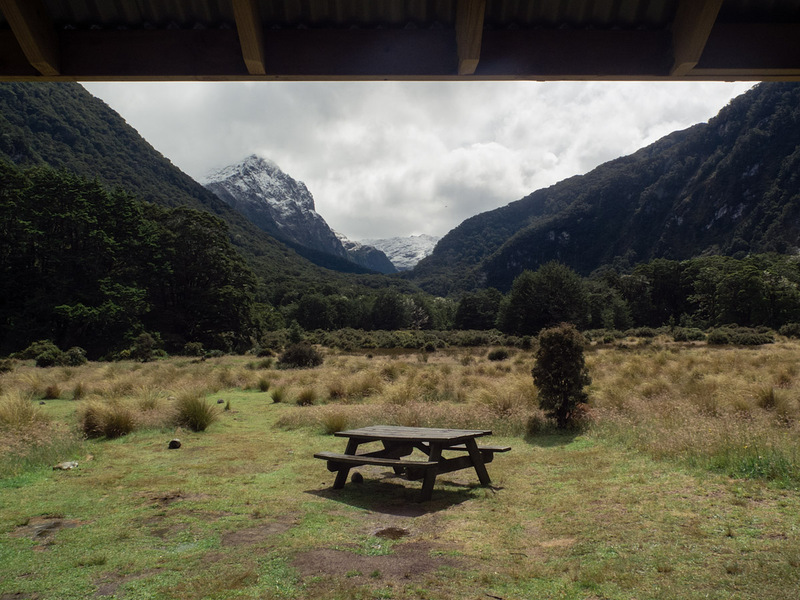 After 21km I reached Motarau hut, the stopover for the night. 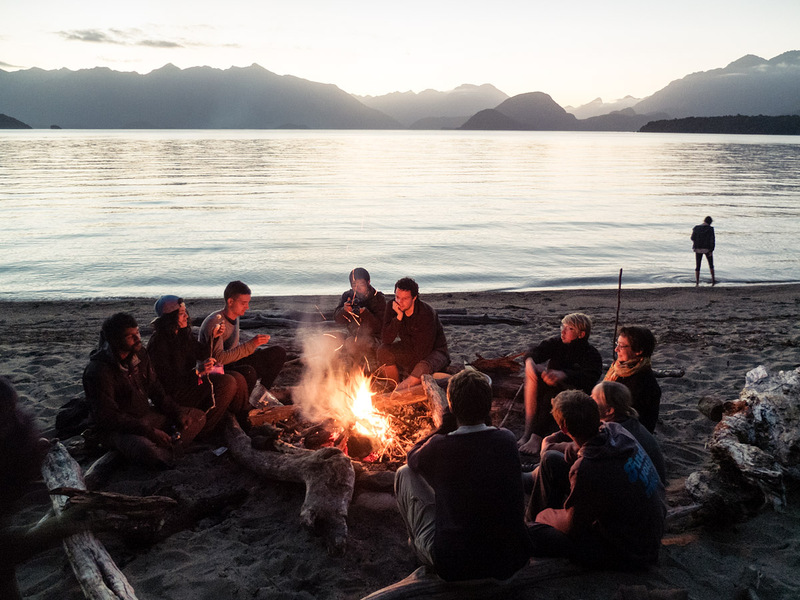 With some heat left in the day I swam in the lake and when the heat was gone I sat around a bonfire on its shore. The sun set behind the mountains, thin shelves of cloud about their necks, but otherwise it was a clear and serene evening. In the morning there were different clouds and the forecast was bad. At 16km it was to be a shorter day’s walk but the last hour was through driving rain. Though it was only 1pm when I reached the campsite at the foot of the mountains I was cold as soon as I stopped moving. The only thing to do was get into my sleeping bag and wait out the day. It was a long eight hours until dark and there was a darkness in my head. On the mountains above there was fresh snow and again I had the feeling of being trapped. I read Cormac McCarthy and thought about my America trip. If I was finding this difficult then how would I cope alone for a whole month? Planning it had been a form of escapism from the situation in Queenstown but thinking about it now offered no escape from the situation I was in. I awoke unsure whether to continue. A Frenchman came to my tent, stating his intent to go up the mountain. The ranger told him that, dressed as he was with no waterproof top, he would be “coming down in a body bag”. Since I was cold enough at the current altitude I figured my chances were only slightly better and practical concerns overruled any I had about my character. 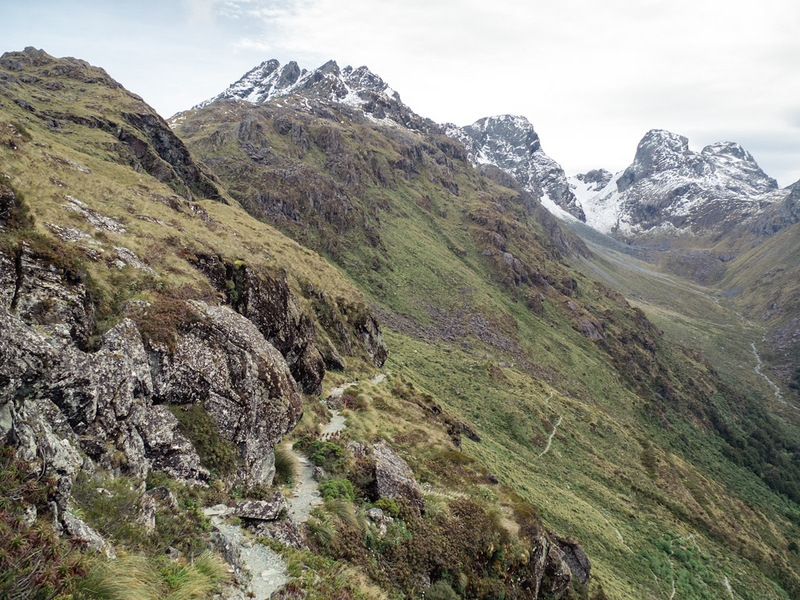 We backtracked 22km to the nearest road, joined by some Belgians and Germans who had come down from the mountain the previous day, just before the weather, and who were kind enough to give us a ride back to Te Anau. In Te Anau I checked into a hostel for the night. 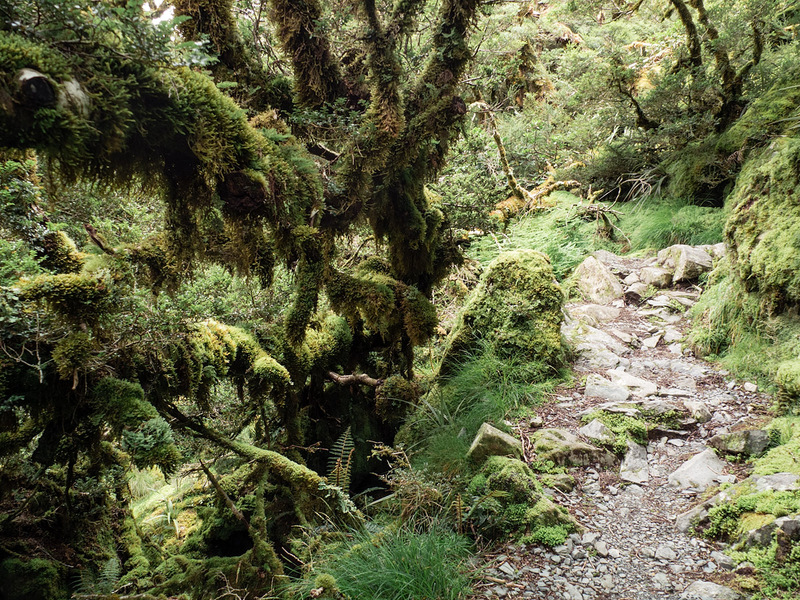 The anxiety engendered by my experience on the Kepler track remained. I immediately set about curtailing my America trip to something less challenging in a flurry of Facebook messages and flight searches. The next morning I did my first ever hitchhiking. 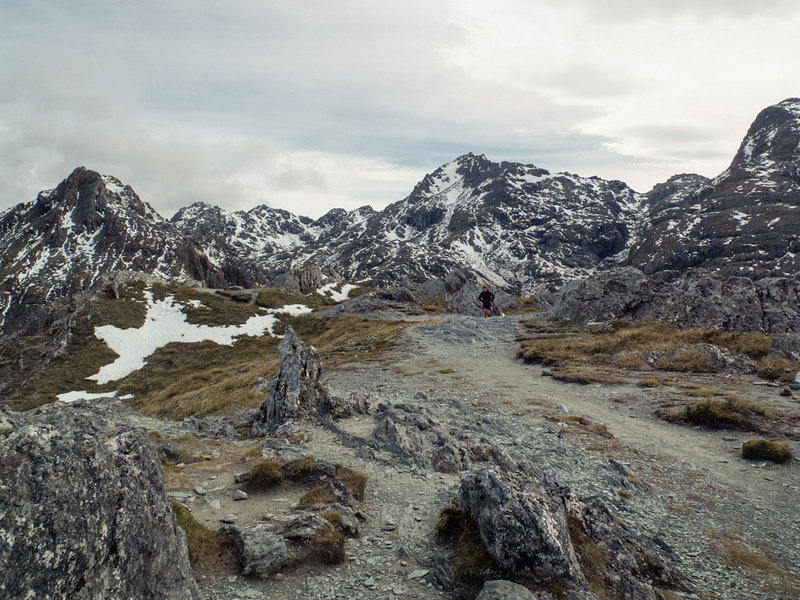 The third car that passed picked me up, a couple of English ladies on the cusp of sixty who happened to be going to the start of the Routeburn Track as well. 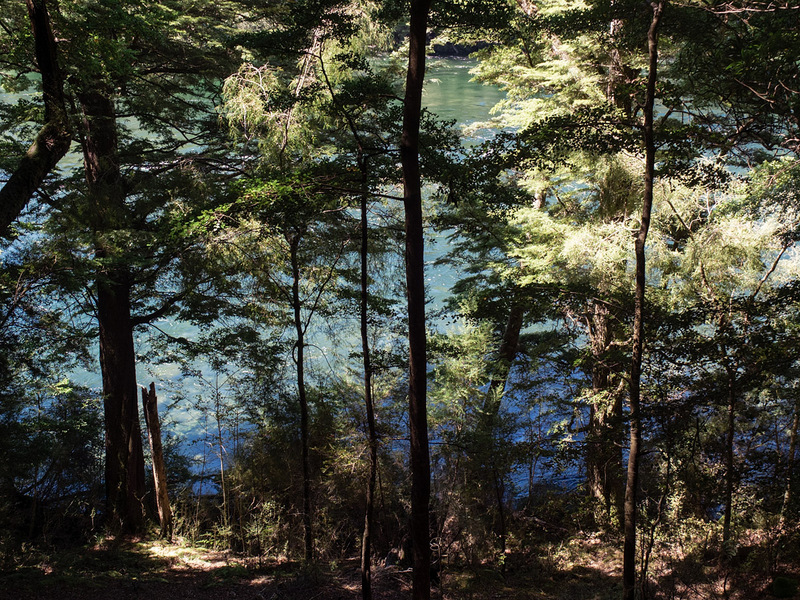 The rest of that day was few easy kilometers to Lake Howden Hut. It felt like a house with an entire national park for a garden. For no money could you get a hotel in such a location. Looking out from the wooden porch the only sign of any human presence was the track leading off into the bush. In the morning I started before sunrise. In the forest the only light was from my headtorch, the only sounds the first birds and the streams that crossed my path, they bound for the valley and I for the tops. I had left myself the rest of the track to do in a day. At 28km with 750m of ascent (and to the displeasure of my still-injured knee, 1000m+ of descent) I thought it would be tough. But the weather was glorious and I was buoyed by the prospect of actually finishing something I’d started. 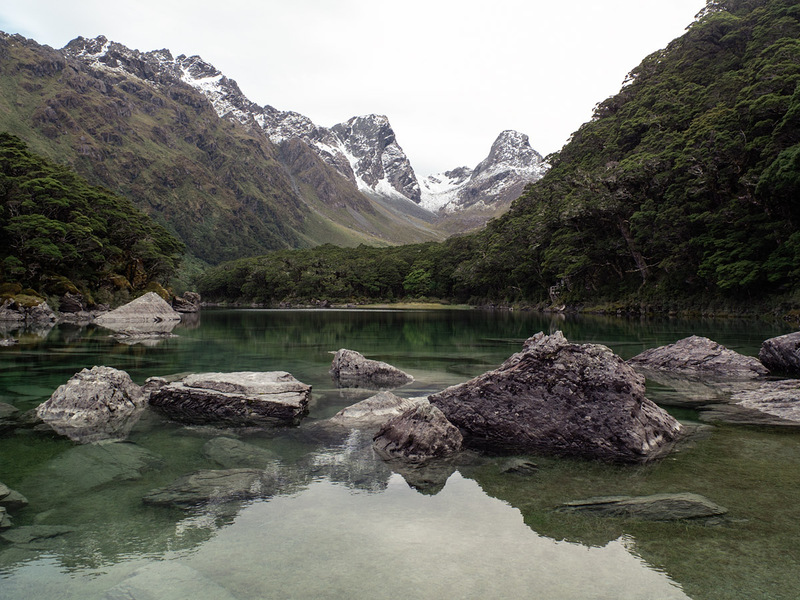 By the end of the Routeburn track I’d walked about 100km in 4½ days. I hitched a lift back to Queenstown with a couple from London. They were even kind enough to turn back when, after 15km, I realised I’d left my camera in the car park. So I’m especially thankful to them for being able to show these photos at all. The situation in Queenstown had made me doubt my motivation for travelling. I set off on the Kepler with something to prove but was quickly reminded that the biggest battle is always and ultimately with oneself. If I were to go straight into another mentally difficult situation in America would I be longing all the time for home or the next trip, rather than the places I’d have to expend so much effort to reach over there? Spending time by myself in the backcountry gave me space to acknowledge the misjudgements I had made. 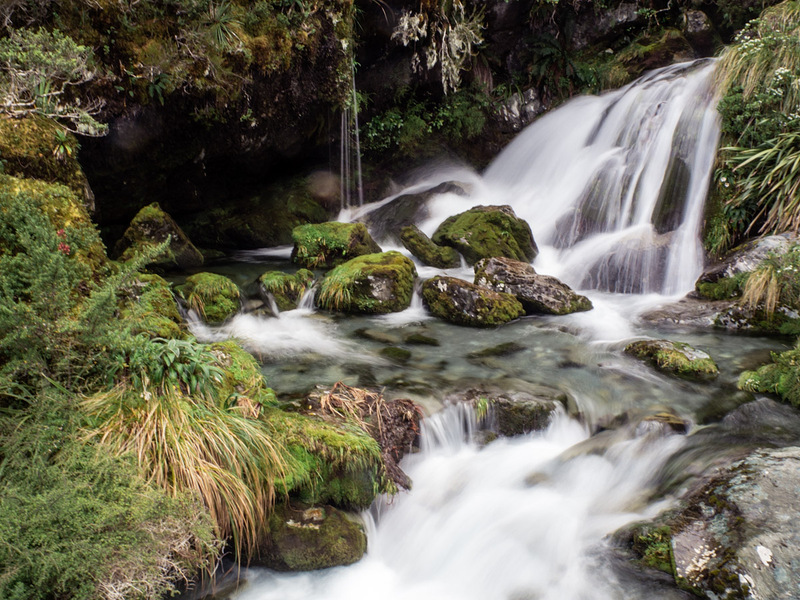 Curtailing my plans for America gave me the freedom to enjoy the time I had remaining in New Zealand.